Goodwill’s mission to change lives and strengthen communities through education, training and work would not be possible without the generous support of our donors. See below for a complete list of Goodwill donors in 2017. McGrath North Mullin & Kratz, PC LLO. Pansing, Hogan, Ernst, & Bachman, LLP. Kathryn and Thomas Sudyka, Jr.
Goodwill’s mission to change lives and strengthen communities through education, training and work would not be possible without the generous support of our donors. See below for a complete list of Goodwill donors in 2016. Metro Disposal & Recycling Inc. Thanks to Mutual of Omaha for supporting the Goodwill mission! Goodwill employees help unload donations at the Mutual of Omaha drive. On July 25th & 26th, Mutual of Omaha employees brought more to work than just a briefcase and coffee. 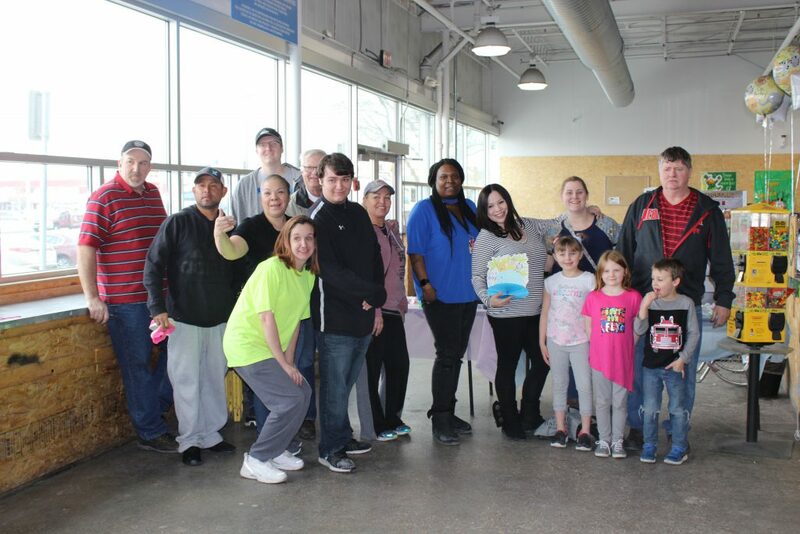 They brought 400 pounds of clothes, mason jars, scrapbooking supplies and other donations to support Goodwill’s mission of helping people find work. This may have been the first Mutual of Omaha/Goodwill Donation Drive, but it’s not the first collaboration between the two agencies. Mutual has been a longtime supporter of Goodwill’s mission — Liz Mazzotta, Mutual’s VP of Human Resources, serves as Goodwill’s Chairman of the Board (and she made a donation during the drive). Mutual has also been a sponsor of our annual Golf Classic, and Goodwill held its 2012 Annual Awards Dinner under the Dome! For their continued support, Goodwill would like to thank Mutual of Omaha! Partnerships like this help us change lives and strengthen communities through education, training and work! Thanks for making Drive for Drives a huge hit! There was a day a couple years ago that many of us thought would never be topped. It was our second Drive for Drives, hosted in the southwest corner of the Crossroads Mall parking lot. Lines to donate wrapped through the parking lot, out the driveway and even backed up out onto Dodge street. Donated computers piled up faster than the Goodwill employees and Omaha West Rotary volunteers could load them onto the truck. At some points, the stacks grew even taller than some of our employees. We were hoping to fill six trailers that day. Thanks to our 750 generous donors, we filled twelve. WOWT's John Knicely thanks donors at the Drive for Drives. Since then, Drive for Drives has continued to be an enduring success, providing some fantastic computer donations that have helped fuel record-breaking sales at our GoodBytes store and materials for our recycling efforts, both of which generate revenue to fuel our employment and training services for people with disabilities and other disadvantages. And then last Wednesday happened. We weren’t quite sure what to expect. We’d just hosted a drive in the spring, and we’ve always hosted them on weekends. This was to be our first weekday drive. We thought 750 was a lot of donors back in 2011. By the end of the day, 1800 donors rolled through the old Cinema Center parking lot at 84th & Center. And their donations filled 15 trailers! Goodwill employees and the Omaha West Rotary definitely played a big part in the day, but it could not have been the success it was without help from the YouthBuild Omaha volunteers (who were graduating the next day!) and 18 WOWT personalities and staff members, who greeted, directed and thanked the donors and helped load the computers, monitors and printers onto the trailers. And speaking of WOWT, their promotion and coverage of the event was amazing. Check out their recap, which includes quite a few Goodwill and WOWT cameos. Thank you to all of you who came out to donate materials last week (or sent your materials with your friends). We couldn’t do what we do without your donations!